Sometimes, a business will need to decide whether to close down a loss-making division. Hence, it will have to consider avoidable and unavoidable costs. 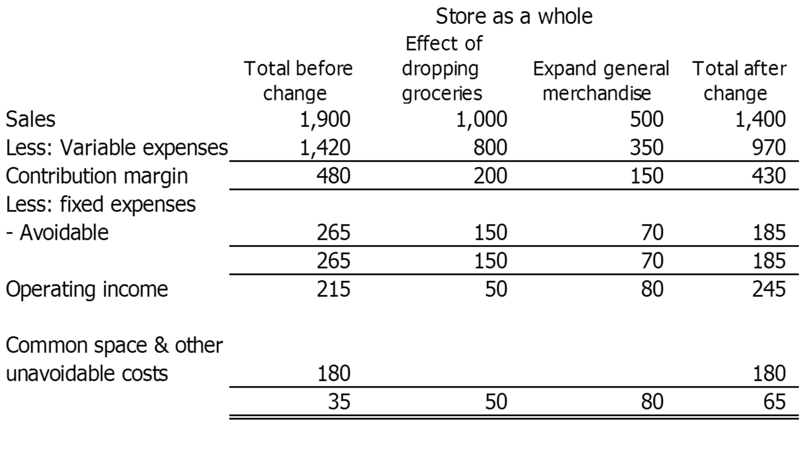 Avoidable costs are those costs that can be saved by not adopting a given alternative, whereas unavoidable costs cannot be saved. In other words, avoidable costs are costs that will not continue if an ongoing operation is changed or deleted. 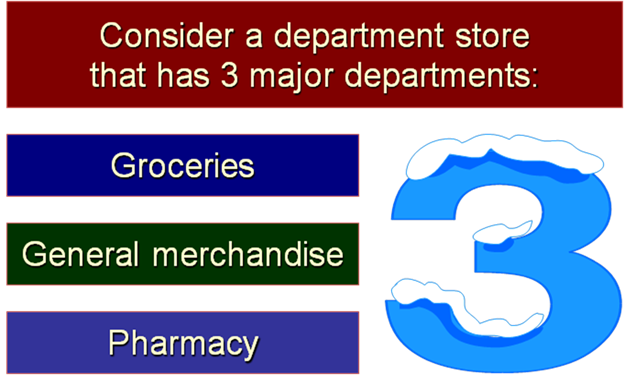 For instance, if a department in a store closes, then the staff would be released or let go. Therefore, their salaries would not need to be paid anymore, and are avoidable costs. Unavoidable costs are costs that continue even if an operation is halted. For instance, centralized air-conditioning costs for the whole building would continue. Likewise, insurance is usually purchased for the entire building and the cost of that would continue despite the closure of one department. Depreciation of the building, too, will continue to be charged. For this example, assume first that the only alternatives to be considered are dropping or continuing the grocery department, which shows a loss of $10,000. Assume further that the total assets invested would be unaffected by the decision. The vacated space would be idle and the unavoidable costs would continue. Let’s see what happens when we drop the grocery department. 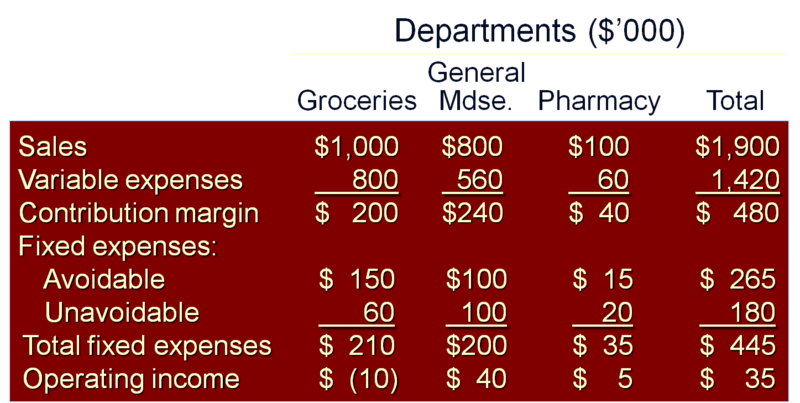 We can see that sales, variable expenses and avoidable fixed expenses (remember, these will stop once the department is closed) will be subtracted out from the total sales/expenses of the whole store. 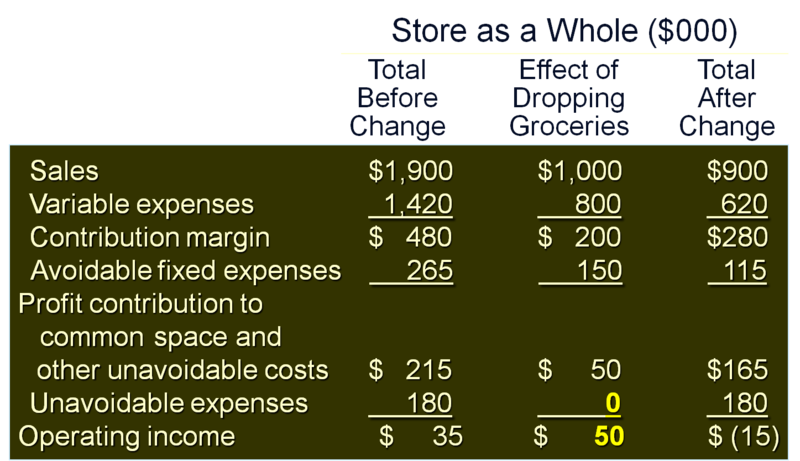 But check out the unavoidable expenses – these will continue whether the grocery department is open or not. So they don’t get deducted. Finally, look at the totals after the change (rightmost column). You will see that the total operating income has REDUCED eventhough a loss-making department was closed. Why? Because the profit contribution from the department is now zero, whereas previously, it helped to offset the total unavoidable expenses. Therefore, closing the grocery department is NOT a good decision. Now, let’s assume that the store could use the space made available by the dropping of groceries to expand the general merchandise department. This will increase sales by $500,000, generate a 30% contribution-margin, and have avoidable fixed costs of $70,000. Notice that the closed department has been replaced with a more profitable one. If you compare the before and after figures, it is clear that there is an overall increase in total profit (a deduction of $50,000 and an increase of $80,000, or a net increase of $30,000). Therefore, dropping the grocery department and expanding the general merchandise department are GOOD decisions. Take home point: Always be clear about what costs are avoidable and what are unavoidable before making discontinuation decisions. Return to Introduction to Management Accounting from Discontinuation Decisions.